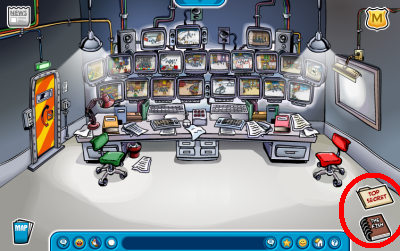 An Awesome Site About Clubpenguin! Clubpenguin was made in Canada in October 2005.It suprisingly doesn’t look the same as it did back then.It looks way different not really a lot though.There wasnt as much rooms, and fewer games.I wasn’t around that long, but from Google.com, and everything, I just know all this stuff.That’s really all I wanted to tell you.O yeah, sorry I havn’t been posting a lot, i’ve been REALLY busy.Bye! When you are a secret agent, go to the HQ, then look in the bottom right hand corner.There are a couple books.One is ”Top Secret”, and that has missions in it.I don’t know if the folder will fill up or not.The other book is called ”The F.I.S.H”.LOL, funny name.Anyways, that folder has, secret agent items, the PSA secret code, information about Clubpenguin, and some more.Well thats all I needed to tell you.Wow that picture is blurry.LOL.Bye! Hey, did you know that you can find secret codes around Clubpenguin?Well you can.First, you have to know the secret agent secret code.I kinda memorized it.The codes are located, on the clock at the Snow Forts, I forgot where else they are.Sorry.If I knew, i’d tell you.To learn the code, go to the HQ.Then theres a book in the bottom right hand corner.I forgot which book.There ya have it.Cag97, out! Did you know theres a stage in Clubpenguin?Well there is.It’s in the Plaza.It’s the middle building of the Plaza.You can buy costumes, be a part of the play, play an instrument there, and more.It’s really fun.I love going there and doing all the activities that I mentioned.My favorite thing are the costumes.I love collecting costumes and outfits.O ya, theres also an audience.And theres also two floors in the awesome place.Go ahead, try it out.I meen it, try it out.GO!Joking with you.LOL.Like I said, it’s really cool.A new play comes out every month.Well, that’s about it!Cya. The ”PSA” stands for ”Penguin Secret Agency”.If your a secret agent in Clubpenguin, you can go there.You can become an agent if your 30 days and up.You can’t become one if you got banned.I’m an agent.When your in Clubpenguin, click the top right hand side of the screen.It will say ”Become An Agent”.Click it, and you will take a little quiz.When you pass the quiz, you have a spy phone on the bottom right hand side of your player card.To visit the ”PSA”, a little button on your spy phone says, ”Visit Agency”, or something like that.Click the button.There you have it, your in the ”PSA”!O yeah, you can also buy items if your a member, and you also have cool missions.That’s all.Bye! There is a pirate named ”Rockhopper” who visits Clubpenguin once in a while.Recently, his boat crashed, and he rowed a little boat to Clubpenguin.He’s ok though.He gives items to penguin, but he does’nt really charge you a lot for the items he sells.He’s a really nice pirate who enjoys seeing every penguin in Clubpenguin.He is red, he wears a pirate hat, and has a long beard.If you find him, click his player card, click the smiley buttom on the bottom left hand side, he’ll give you a free item.You sadly can’t be his buddy.O yeah, his boats name that crashed is called the ”Migrator” ship.But he’s still cool even though you can’t be his buddy.So, this is about ”Rockhopper”.Here’s a picture of him. 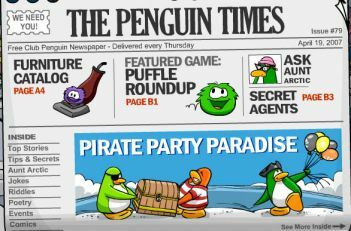 ”The Penguin Times” is the newspaper in Clubpenguin.It comes every Thursday.A penguin named ”Aunt Arctic” writes it.I told you this in my last post.”The Penguin Times” has comics, imformation, poetry, games sometimes, upcoming events, news of course, and lots more.Remember to check out ”The Penguin Times” every Thursday.Remember what it has and contains.Well, enjoy the paper!See ya! Hi!I'm Cag97.I'm of course, the owner of this site!Thats my nickname on Clubpenguin!I hang out at the Dock a lot, and have many friends.I also hang at Mammoth server.I hope I see you on Clubpenguin.I be peoples buddy if, I know them, there famous, or your nice to me, and my friends.O ya and if you hang out with me a alot on Clubpenguin.Bye!O ya and, do not copy from the page!